You are here: Home » MEDIA » Books » The Enlightenment Vision by Stuart Jordan (book review). 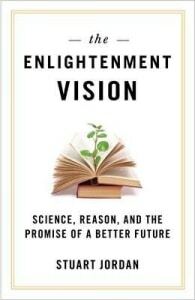 The Enlightenment Vision by Stuart Jordan (book review). ‘The Enlightenment Vision’ by Stuart Jordan is, to my mind, an odd book. Its sub-title ‘Science, Reason And The Promise Of A Better Future’ clearly points out that it is a pro-science than pro-religion book. I say that deliberately because many see enlightenment as a religious stance these days. In fact, as Jordon points out, the term ‘enlightenment’ goes back to the Renaissance and Reformation eras where in France and Great Britain, science began to dominate and reduce the hold of religion on people. Jordan points out that the fledging USA took much of this stance from us Brits as that was where most of their immigrants came from. I wish at that point he explained why his home country is speedily sinking back into religious dogma whereas it hasn’t so much in the UK. He does point out that American politicians who claim they don’t understand evolution as a means to get votes which doesn’t make much sense. If they all come from the same educational background or rather lack of it, if they aren’t taught the basics of evolution and the survival of the fittest (rather apt for politicians!) then they must surely have the same level of ignorance. Jordan really needs to be careful of blanket statements without considering things like this. It is also interesting that he believes imagination is needed in the scientific method without a better detailed explanation. After all, the physical sciences – physics, chemistry and biology – are not interpretative but understanding cause and effect. The wrong use of imagination and seeing something that isn’t actually there, like canals on Mars, can mess up real progress. If he means that little jump in recognising an anomaly isn’t a test error or something else is going on, then it’s less to do with imagination but stubbornness to find out what is going on. His morality test example of always telling the truth on page 78 depends more on the moral stance of the person asking the question. He uses a WW2 hypothetical situation of the Gestapo knocking on doors asking people if they are hiding Jews and saying no as a test for whether you would lie or not. I doubt if once anyone hides anyone from potentially being murdered that they are likely to rescind that safety against such people, more so if they also suspect they would be imprisoned and killed themselves. The morality issue, to my mind, happens with the offer of sanctuary and what that entails not with the knock at the door. Just in case you think I’m always coming down on Jordan, he does quite rightly point out that holocausts weren’t started in WW2 as the likes of the Mongol invasion of Asia was clearly that and there are other examples in history. Shame he doesn’t give line space to these and even reference to Native Americans comes up in the footnotes, many of which were done in the name of religion which would have supported his argument. Jordan makes very valid reasons why politics should be divorced from scientific research and the example of George Bush putting stem cell research off for his US president tenure must surely have cost people’s lives by such a stance. Scientific ignorance is not an excuse to curtail needed scientific research. There are some areas which he comments on but doesn’t explore sufficiently. It’s all very well noting that there are problems in the US education system but there is a need to effectively bring science back to the fore than religious dogma with at least some suggestions to do so. Without that, things will only sink lower. People like using technology but not appreciating the science behind it must surely be the most confusing aspect and surely deserves a SF scenario to see where that leads today. Saying that, off the top of my head, I can recall several TV SF series who have done something in that line but who would have thought that it would come to pass on our own planet? His views on having classes in ethnics at school really do need to be read. It doesn’t just apply to the sciences but across all of its uses. A lot of people instinctively know the difference between right and wrong but few people below university level think or even verbalise or write about it at school level. Having an appreciation of ethics would have a top-down effect that might remove people from particular jobs that don’t take into effect what they do affects other people in a bad way. Stuart Jordan’s book will make you think a lot but I wish he had more answers that could be effectively carried out. One thing that will put some of you off reading it is the massive footnotes at the back of the book which is practically novelette size itself. Thing is, there’s a lot of useful information that explains more about his references. I’ve come down a lot on authors who think they are writing a thesis than a book for the population but surely there must be a time when such information can be carried in the main text. Refusals to do that is far more likely to keep books such as this away from the kind of audience who really need to read the book. No wonder they are being kept uninformed. If you want enlightenment, then surely there is a need to communicate to the people who need it at the level they can understand. « Bath Salt Zombies (DVD review).